Some residents on Hassan Street, Ilasamaja, in the Oshodi Isolo area of Lagos State have raised the alarm over drooping high tension wires on the roofs of their houses. The residents said although only the neutral cable was resting on the roofs at the moment, any of the other cables could trigger off disaster at any time. They claimed that efforts to get officials of Ikeja Electric, the power distribution company in charge of the area, to avert the looming disaster had been abortive. A landlord on the street, Wasiu Bayioku, said the problem started after one of the poles on the street broke at the base. He said, “After the pole broke, the situation was worsened by articulated trucks and trailers which pass through the street. Whenever these trucks go under wires that supply electricity to our houses, they pull the wires. This puts more stress on the broken pole and makes the high tension wires to fall more. “When I observed this, I went to the Isolo office of Ikeja Electric to complain. We had a meeting and in the end, I brought them to see the situation. After an on-the-spot assessment of the problem, they promised to do something about it. The Punch obtained a letter by the Gbadamosi Community Development Association addressed to Ikeja Electric, which stated that there had been sparks from the cables. The letter, while stressing the urgency of the matter, noted that two children had been killed by fallen cables in the community in the past. Bayioku, who claimed to be the financial secretary of the Gbadamosi CDA, said some representatives of the Ikeja Electric visited the community last week. He added that despite assurances to replace the pole, nothing had been done. Another landlord, John Okwara, lamented that there were many damaged poles in the area that could spell doom for residents if not replaced. He said, “We have been battling this problem of damaged poles in our area for more than five years now. There are some poles that are resting on weak fences. “An infant was killed some years ago by a fallen cable on the street. It is very painful that this situation is about repeating itself. The Ikeja Electric officials pass through the place every time without doing anything. “If you look at the cables, you will discover they are in four layers – red, blue, yellow and neutral. The neutral is already touching the roof. The blue is a few inches to touching the roof as well. The pole itself is about falling. So, the situation is critical. While stressing the importance of safety, Okwara said it had been difficult persuading residents to contribute towards the replacement of the damaged pole due to economic hardship. 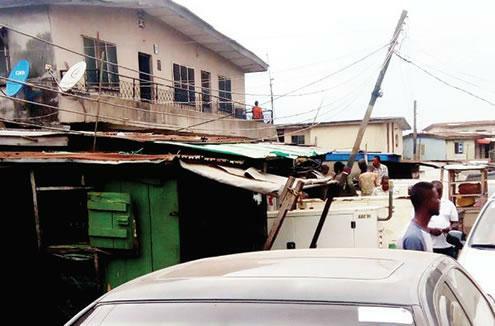 A shop owner on the street, Oluwole Ogunleti, who appealed to the power company to assist the community before tragedy struck, said he was afraid for his life. The Head, Corporate Communications, Ikeja Electric, Felix Ofulue, had yet to respond to a text message sent to him on the incident.